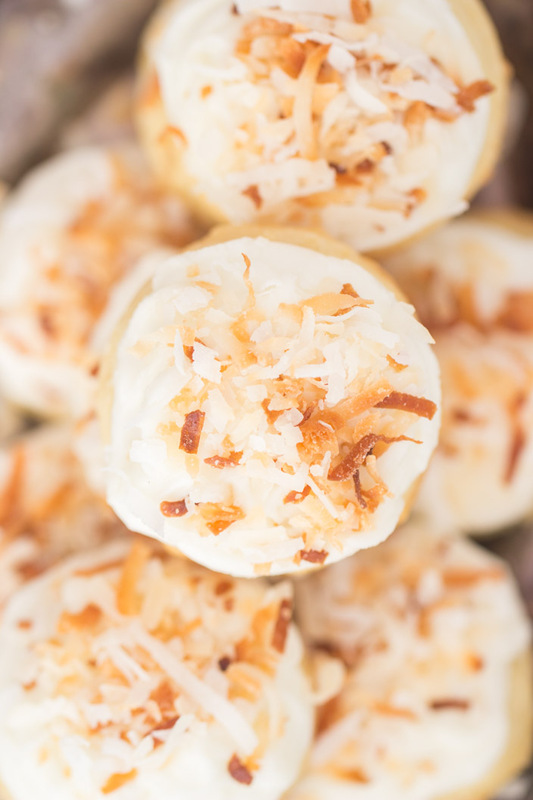 Soft, puffy, melt-in-your-mouth Toasted Coconut Amish Sugar Cookies! These are super simple and make an enormous batch! 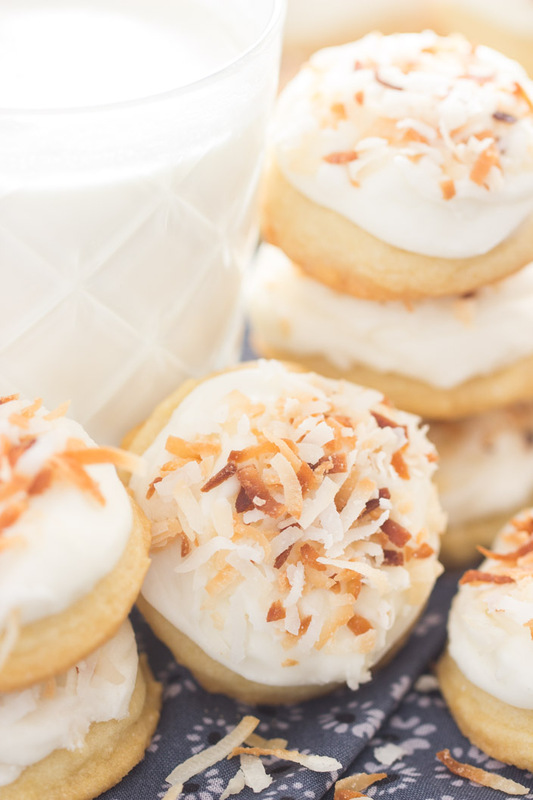 With coconut extract in the cookie dough, coconut icing on top, and toasted coconut to garnish, these Toasted Coconut Amish Sugar Cookies are loaded with coconut from top to bottom. A wonderful springtime and Easter cookie! 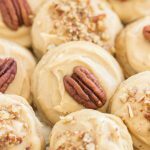 I found a recipe for Amish Sugar Cookies back in the fall, and it was basically love at first sight. In the magazine, Amish Sugar Cookies looked so soft, puffy, and pretty. In real life, they look just like the photo – thick, puffy, and they’re just a really pretty cookie! Super duper easy to make too, and the recipe produces a big batch. When I found the recipe, I just had to try them, and I haven’t really stopped making them since. I’ve made them about 2 dozen times since October or November. They’re nice to look at, yes, but they’re also superb in both flavor and texture, as well as highly adaptable. I’ve done a bunch of variations on those Amish Sugar Cookies already, and more are in the works. Least of all, these Toasted Coconut Amish Sugar Cookies. 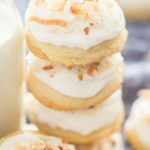 These have coconut extract in the cookie dough, a thick layer of coconut icing on top, and are garnished with toasted coconut. Through and through, they are coconutty. They’re the perfect springtime cookie! 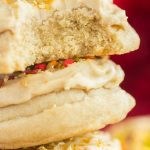 The icing is amazing – it’s not just powdered sugar, extracts, and milk – I also add melted butter so that it’s richer and it sets a bit faster when you’re icing the cookies. Icing is all the better with a bit of melted butter. This icing does not skimp on coconut extract either though. And let’s back up for just a quick second to revisit the flavor/texture discussion. These remind me so much of cut-out cookies, a rich, buttery cut-out cookie, but they’re just not quite as crispy. They’re ever-so-slightly crispy on the edges, but mostly soft and tender…. they taste exactly like a cut-out cookie. 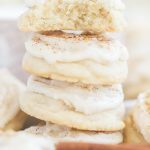 These Toasted Coconut Amish Sugar Cookies are wonderful because they’ve got an even split of butter and shortening, so you get all the flavor and richness that butter adds to cookies, but they stay thicker and don’t spread as much due to the shortening. Shortening produces a less flat, puffier cookie, as well as a softer cookie. Another reason that Amish Sugar Cookies are so special is because they’ve got an even split of granulated sugar and powdered sugar. They’re not as grainy as a typical sugar cookie, and they have a really soft, smooth texture because of the powdered sugar. Genius! 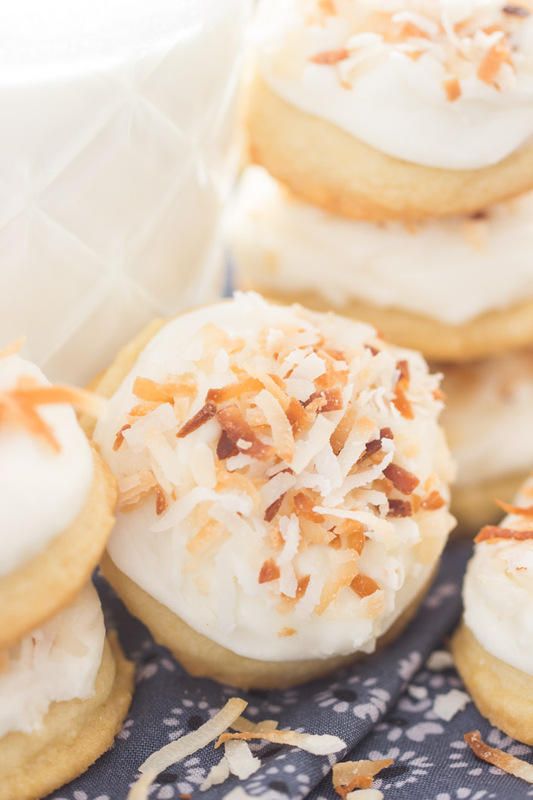 Once you try these Toasted Coconut Amish Sugar Cookies, you won’t be able to stop, and you’ll be looking for more ways to include Amish Sugar Cookies in your life. The other variations that I’ve made so far include these Iced Lemon Amish Sugar Cookies and Iced Almond Amish Sugar Cookies. I adore them both, and both are wonderful for spring. Updated March 2019: I’ve now made ALL THESE versions!!! 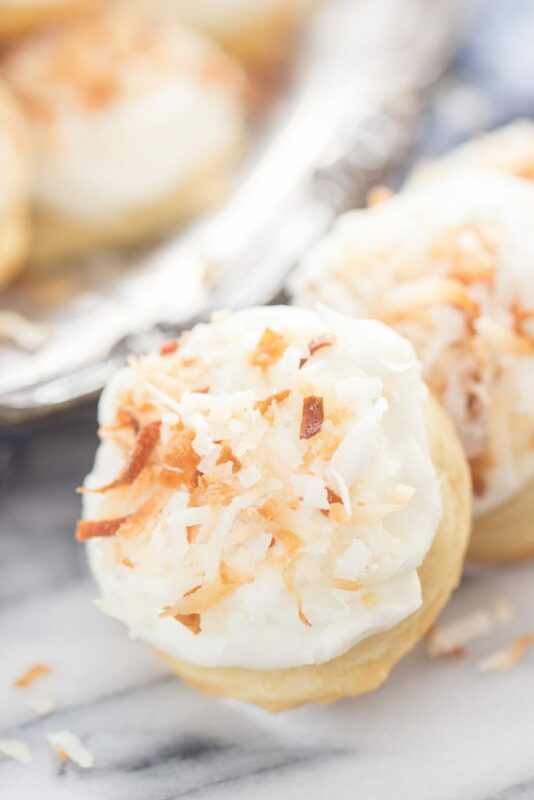 These Toasted Coconut Amish Sugar Cookies are definitely a cookie to include in your Easter baking, but you must also consider these Easter Chicks Lemon Cookies. Simple cake mix lemon cookies, shaped and decorated as yellow chicks. 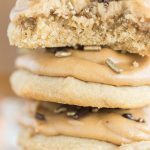 They are super easy to make, and are a great cookie to make with kids! What else will you make for Easter?? 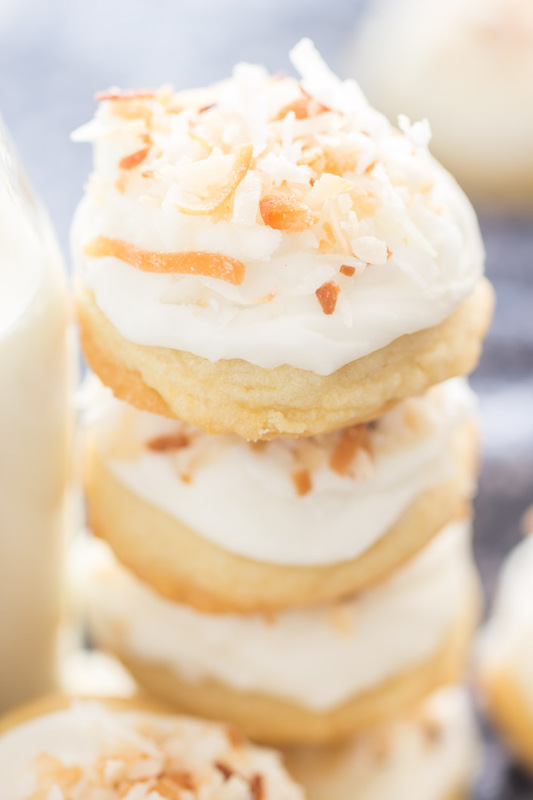 Soft, puffy, melt-in-your-mouth Coconut Amish Sugar Cookies! These are super simple and make an enormous batch! 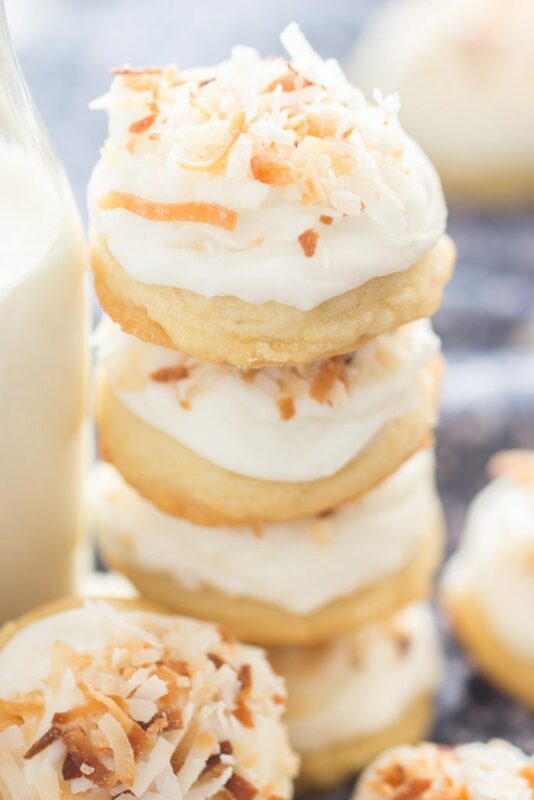 With coconut extract in the cookie dough, coconut icing on top, and toasted coconut to garnish, these Coconut Amish Sugar Cookies are loaded with coconut from top to bottom. A wonderful springtime and Easter cookie! In a medium bowl, whisk together melted butter, extracts, milk, and powdered sugar until smooth. Add additional powdered sugar, if needed, to achieve desired consistency. Thick, but spreadable, and won't run off the cookie! 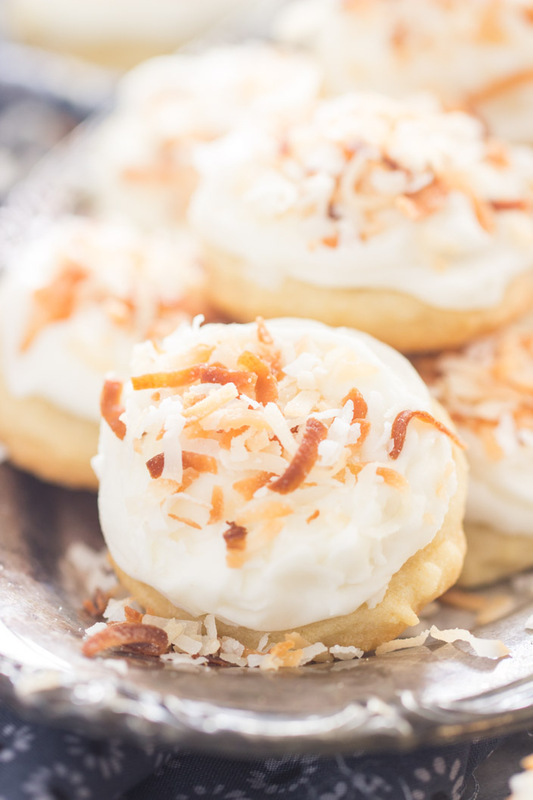 Spread icing over cookies, and sprinkle with toasted coconut. These are good for up to a week, but best within the first 3 days. After 3 days, they get crumbly and a bit on the drier side - still a delicious cookie though. These freeze really well - even iced. But make sure to allow iced cookies to set before freezing, and separate layers of cookies with wax paper or parchment paper! 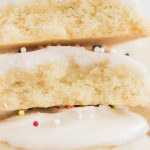 I've made other variations on these Amish Sugar Cookies, including these Coconut Oil Amish Sugar Cookies, Iced Lemon Amish Sugar Cookies, and Iced Almond Cookies!